Alan McLaughlin was 26 when he took his own life. He had battled an addiction to Lyrica for 5 years. At 21 he was prescribed the drug after breaking his jaw. When the doctor stopped prescribing it, he bought it illegally. "He was able to hide it from me," his mother Lisa said. "The doctors stopped prescribing it without realising the withdrawal he'd go through and then he just started buying it - it never seemed to be enough. "You can get it anywhere," she added. It is linked to 33 deaths in 2017 in Northern Ireland and has re-classified as a class C drug. "It got to a stage where Alan wouldn't buy food. He bought Lyrica before he bought food. That was so bad. "When he didn't have Lyrica he would crawl the walls. He couldn't sleep, the stomach pains were immense." Lisa said the drug began to take over Alan's life. "He was like a zombie," she said. "If he took enough to be normal he was fine - you wouldn't even know he was on it. "You just wouldn't have known he was in withdrawal, but if he took more than that he was just awful - his eyes were rolling, not wanting to do anything, tired, no energy." But the drugs didn't just have an impact on Alan. They also had a huge impact on his family. "It broke my marriage," explained Lisa. "I would want to do one thing and my husband the other, you know, give him some tough love. 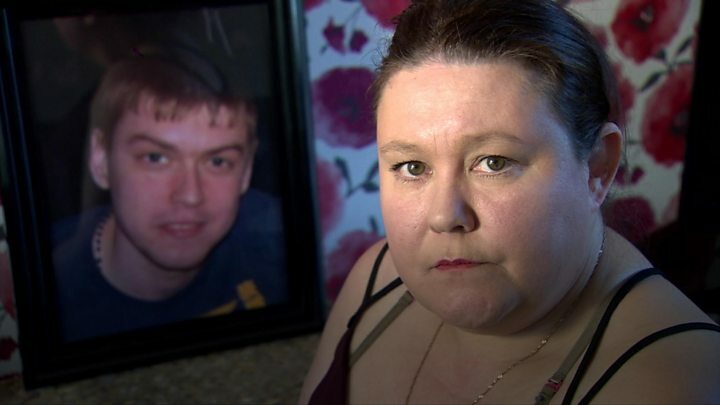 Lisa says it was extremely difficult to watch the destructive impact the drugs had on her son. "The day he died he asked me to put electric in his metre and I just got really fed up with running two homes on my wages and I said, 'I've no money son'. And that was the last time I spoke to him. "He suffered a lot. Lyrica is very cruel. It just changed him and nobody wanted to be around him when he was doing it - but everyone wanted to be around him when he was Alan. She added: "He didn't understand how much he was loved." If you've been affected by addiction, help and support is available at BBC Action Line. If you live in Northern Ireland, you can call Lifeline, a 24 hour helpline on 0808 808 8000.